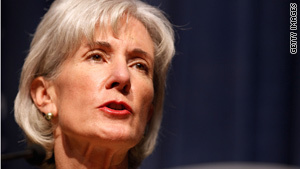 An intruder was allowed to reach the outer office of Health and Human Services Secretary Kathleen Sebelius. Washington (CNN) -- A man flashed bogus credentials and was permitted to reach the outer office of Health and Human Services Secretary Kathleen Sebelius over New Year's weekend, agency officials confirmed Friday. Sebelius was not in the building during the incident January 2, but a spokeswoman issued a written statement saying "this was a troubling incident" and acknowledged that the man was on a list of people barred from entering the building. The man is considered an intruder and remains in federal custody pending a detention hearing next week, according to documents filed at U.S. District Court in Washington. The Washington Post reports that the man was known to Health and Human Services workers, who recognized him from a photo as he sat in a waiting area talking on his cell phone. Agency spokeswoman Jenny Backus said security was breached when private security guards at the building's entrance apparently accepted the false credentials the man presented. He then took an elevator to the sixth floor offices of the agency chief, said another agency official who asked not to be named, deferring to Backus. Backus, in the written statement, did not identify the man or explain why he was placed on a list of people to be denied access to the building. She did not return calls seeking comment. In her statement, she said the agency "has taken immediate corrective actions," including a review of training for guards regarding the rules of access.